For the first time in its history Blue Collar Lobster Co. will open its doors to host a Halloween concert featuring two of the area’s premier local original bands. On Saturday October 27th Pier Ave and Over The Bridge will take the stage for what will be an incredible night of roots, rock, and reggae. The two groups are joining forces for the evening to send a message to local music lovers. Their message is simple: The local music scene needs more collaboration. “Local musicians need to work together to promote unity and support one another. By doing this we can create a scene that is great for venues and live music fans alike. The North Shore is where we are from, and the artists who call it home are our family not our competition.” As two of the area’s highest drawing local bands the show is sure to bring in live music fans from all over Boston’s North Shore and beyond to show their support for the blossoming local music scene on Cape Ann. Tickets to the show are on sale now! The event boast’s an impressive lineup of local sponsors, FREE giveaways, a $500 cash prize for best costume, professional sound and lighting display provided by Davis Thurston Productions. 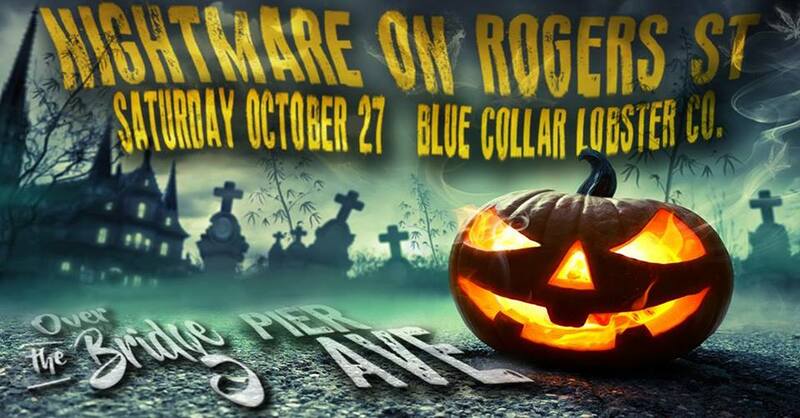 Event Page: Nightmare on Rogers St. This entry was posted in Gloucester and tagged NIGHTMARE ON ROGERS STREET, Over the Bridge, Pier Ave on October 2, 2018 by Kim Smith.